Normal Community remained on top of the Big Twelve Conference, Normal West solidified a playoff berth and Bloomington led wire-to-wire in Friday night’s high school football action. Bloomington senior quarterback Griffin Moore ran for two touchdowns and passed for over 200 yards and two more scores while the Purple Raider defense played well enough against Peoria Notre Dame’s potent Wing-T offense to take a convincing 56-28 victory at Fred Carlton Field. The Raiders scored first on a 12-yard run by Holden Snyder and never trailed, leading 34-14 at thalftime and by a 49-28 margin entering the fourth quarter. Ben Wright made a big defensive play in the first quarter, stripping Irish running back Blaine Stanton of the ball and then running 70 yards for Bloomington’s second touchdown of the game. Drew Crooks added a nifty 42-yard run for a score in the third and sophomore Trey Jenkins gave the offense a lift down the stretch with seven carries for 47 yards and a touchdown. Moore’s touchdown passes were 60 yards to Diontay Griffin, his seventh TD of the season, and a 17-yard play to Ivan Smith. Mauliek Johnson finished with five catches for 47 yards. Bloomington improves to 5-2 and 4-2 in the Big Twelve Conference and travels to Peoria next week. Peoria Notre Dame falls to 4-3. The visiting Wildcats were led by 173 yards and two touchdown on 9-of-18 passing by Carson Camp, as Davion McQuarter carried 17 times for 115 yards and two touchdowns and Cole Hernandez caught five passes for 101 yards. The Wildcats led 20-0 at halftime. Normal West (6-1, 5-1 Big Twelve) clinched a playoff spot with the victory. The host Ironmen led 22-8 at halftime and kept the Vikings off the scoreboard in the second half. Daylen Boddie completed 12-of-17 passes for 235 yards and one touchdown with one interception to lead Normal Community (6-1, 6-0). The Ironmen clinched their 23rd straight playoff appearance with the win. Reece Seidl led the Saints (0-7) with 184 yards rushing and two touchdowns on 29 carries. Liam Brady recorded two catches but both were for scores of 18 and 55 yards. Rantoul (2-5) put the game out of reach on a 60-yard touchdown run by quarterback Angelo Brown. U-High (1-6) turned the ball over on its first three drives without getting a first down, but settled down in the second half. Pioneers quarterback Dawson Brooks was 17-of-33 with 181 yards and two touchdowns plus one interception, and ran 14 times for 64 yards. Glenwood (7-0) finished with 421 rushing yards. The Sages (7-0) pulled away with two touchdowns in the fourth quarter, including an interception return for a score. 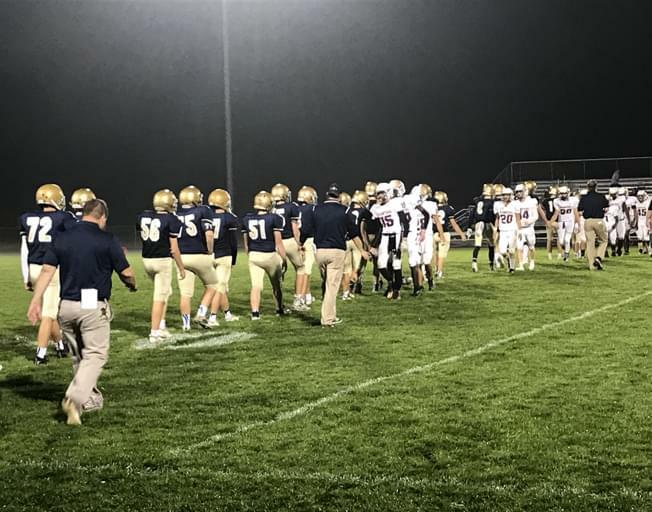 Pontiac (6-1) trailed 14-0 at halftime cut the deficit to 21-14 before Monticello scored three straight touchdowns to seal the win and break the tie at the top of the Illini Prairie Conference. Illinois at Rutgers, 11 a.m.
Wisconsin Lutheran at Eureka, 4 p.m.